BACKING on to the stunning Pinnacle nature reserve and hidden away on the hillside, artist Felicity Green’s large, 2800sqm, sloping block is alive with insects, birds and butterflies. A blend of natives and exotics, Felicity says her Hawker garden aims to be biodiverse for animals, providing shelter, food and habitat, while working alongside what is naturally there. “The soil is tough and rocky, and we get kangaroos coming in for the native grasses, the acacias and poa at the back,” she says. 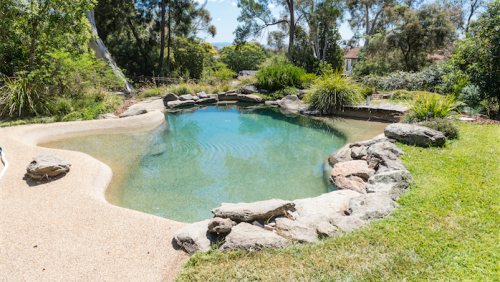 This unique garden will be open to the public for the first time through Open Gardens Canberra on the weekend of March 4-5. 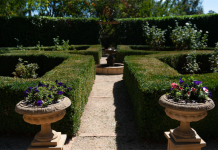 The garden has different sections, with courtyards around the Pettit and Sevitt house, a saltwater billabong pool and a cottage garden with a combination of natives and perennials, including sage, salvias, David Austen roses, wisteria and crepe myrtle. 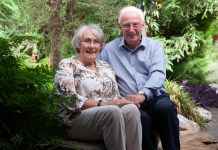 “I love my flowers, and the cottage garden is my favourite place to sit with a cup of tea,” Felicity says. “It’s buzzing with life; it’s not a dead garden. 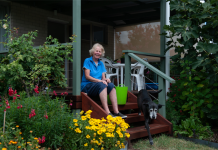 Having moved into the home 10 years ago, Felicity says she has replaced most of the garden over the years, taking the time to figure out what works. “Much of the garden is in the front, with natives in the large space along the driveway,” she says. Fruit trees and a large veggie garden with raised beds in the back provide beans, tomatoes, strawberries, basil, zucchini, NZ spinach, lettuces, apricots, nectarines, plums and Nashi pears. The garden is watered by a 28,000-litre tank. “I feel I’m a custodian here and I’m providing a habitat through diversity for so much life,” Felicity says. Charnwood Community Garden, off Lhotsky Street.